When a hugely famous author has a book coming out, the reading public usually knows about it for months in advance. (Here's a far too obvious example: Th e Casual Vacancy, by J.K. Rowling .) But when it comes to the Japanese writer Haruki Murakami, of 19Q4 and Kafka on the Shore fame, nothing is ever really done by the book— not plots, not genre, and certainly not marketing. (He was infamously tight-lipped before the release of 1Q84. ) It just goes to show that great authors don't always need to "create buzz" to have their work madly anticipated. In fact, the world just learned that Murakami will be publishing his first short story collection in 8 years — and it's coming out in less than a month. Murakami, who's one of those consistently-buzzed-about Nobel favorites, is famous for a magic realist style and Kafkaesque prose — don't be shocked if, while reading his work, a clock levitates, or tiny men walk out from a television screen. Perhaps his best-known short story collection is The Elephant Vanishes, published (in English) in 1993. Murakami's prose is often characterized by a haunting ennui; strange occurrences are barely blinked at, much less officially documented. The shorter form is a perfect introduction to Murakami's work for English readers, who tend to be raised on a steady diet of realism and fantasy, but not much in between. The new collection will be brief: 5 stories that have already appeared in magazines, plus one new piece. The book will be titled Onna no Inai Otokotachi, which translates, more or less, to Men Without Women — a phrase that readers may recognize as the title of Hemingway's second short story collection. One of the stories, "Drive My Car," references the Beatles' song, and has a bit of a drama-filled history: a line in the story offended residents of the town Nakatonbetsu, who felt that they were being depicted as litterbugs. (One character throws a cigarette outside of the car; another responds, “Probably this is something everyone in Nakatonbetsu commonly does.”) Murakami has promised to change the name of the litterbug town. No word on when an English translation of the new collection will be released, but here's good news for Murakami's English-reading fans: the author's last novel, Colorless Tsukuru Tazaki and His Years of Pilgrimage, is coming our way. 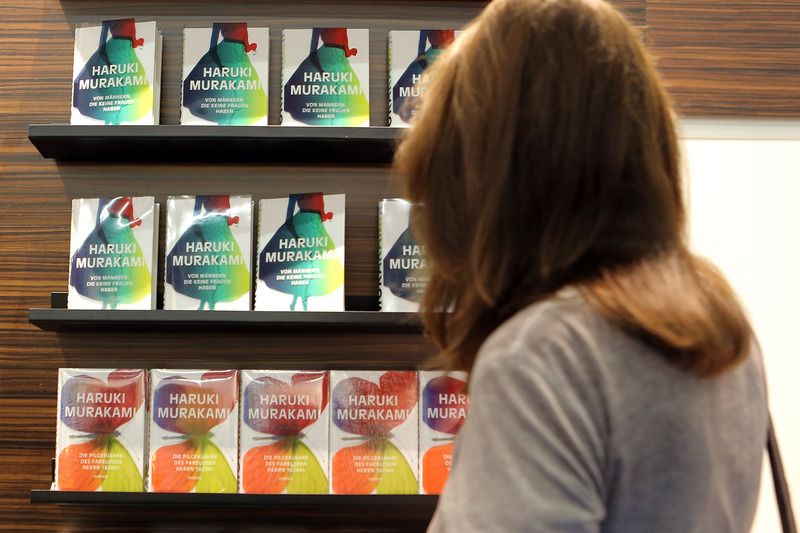 The book sold one million copies in Japan during its first week — fans stood outside bookstores overnight to snag a copy — and then rocketed to bestseller lists in Germany, Spain, and the Netherlands. It will finally be released in English this August. Savor it until Men Without Women is translated, too.